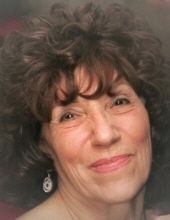 Jane Ricciardi, 81, of Ambler, PA passed away on March 18, 2019. She was the beloved wife of the late Pasquale “Pat” J. Ricciardi. Jane was born in Swedeland, PA on January 18, 1938 to the late Anthony J. and Florence (Tavano) Donatello. She was a graduate of Upper Merion High School. She was the part owner of the former Gifts by Elizabeth in Ambler. Jane was a devout and faithful Catholic. She enjoyed gardening, feeding birds and was always there to help others. She also enjoyed the beach and boardwalk at Ocean City, NJ. Most importantly, she loved her family, especially spending time with her grandchildren and great-grandchild. She is survived by her four children: Angela E. Gill (Raymond), Sandra T. Hummel (Richard), Terina F. Bender (Dean), James C. Ricciardi (Andrea); 9 grandchildren: Jenna, Sean, Erica, Kristen, Richard, Amanda, Dylan, James, Allyson; a great-grandson: Liam; a sister Angeline “Cookie” Donatello. She was predeceased by a brother Orlando Signorini. Relatives and friends are invited to her Funeral Mass on Saturday, March 23, 2019 at 10:00 AM at St. Joseph Church, 16 S. Spring Garden. A viewing will be held on Fri. eve. from 6 PM to 8 PM and again on Sat. from 8:30 AM to 9:30 AM at the Emil J. Ciavarelli Family Funeral Home and Crematory, 951 E. Butler Pike, Ambler, PA 19002. Entombment will be in George Washington Memorial Park, Plymouth Meeting, PA. Condolences may be made at www.ciavarellifuneralhomes.com. To send flowers or a remembrance gift to the family of Jane Ricciardi, please visit our Tribute Store. "Email Address" would like to share the life celebration of Jane Ricciardi. Click on the "link" to go to share a favorite memory or leave a condolence message for the family.